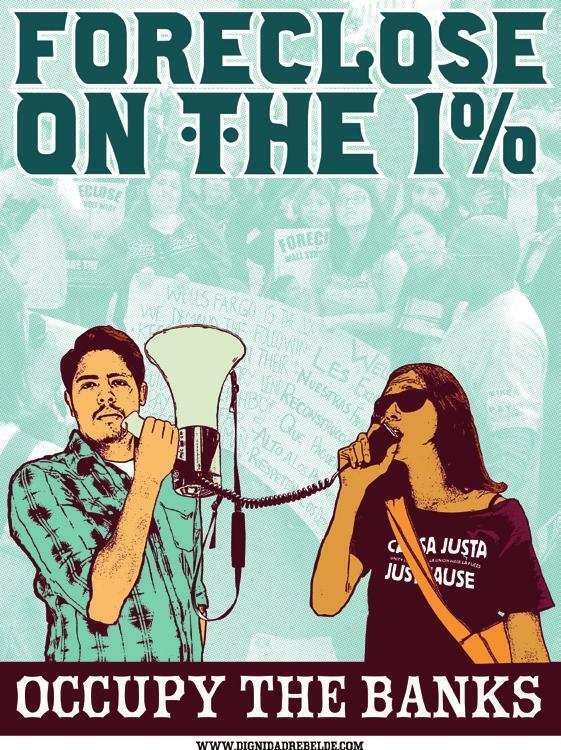 The Occupy protests that began last fall inspired a new politically active generation. Long time organizers and activists have been invigorated and together these groups have joined together around fights for housing and economic justice. This surge of political activism could not have come at a more crucial time for the housing movement in this country. Now more than ever, it is critical that the basic human right to be housed is affirmed. At this current moment, every type of housing in this nation is under attack. Big landlords, big banks, the state and federal government are all working on behalf of the 1% and Blacks, Latinos and women are their main targets. Currently more than 15% of people throughout the nation are living below the poverty line, with Black and Latino communities and families headed by single women, all exceeding the national average. Black and Latino poverty rates are almost three times higher than for whites and overall these figures are the highest the poverty rate has been since the early nineties. Despite this fact, the Obama administration’s 2013 budget proposes almost $920 million dollars in cuts to public housing including project-based voucher programs (Section 8) and community development block grants. The federal level attack doesn’t stop there. New legislation called the Affordable Housing and Self Sufficiency Improvement Act (AHSSIA), is being proposed by the Department of Housing and Urban Development. This law will raise the minimum rent in federally subsidized housing during one of the worst housing crisis the country has ever seen. An analysis by the Center on Budget and Policy Priorities states that more than three fourths of the people potentially negatively impacted by this legislation will be people of color. The federal government controls almost two thirds of the residential properties that have been foreclosed on this year, through Fannie Mae and Freddie Mac. Together these two institutions own approximately 70% of all mortgages nationally that are in some stage of the foreclosure process. As a result of the foreclosure crisis, numerous Black and Latino families have lost the only asset they had – their homes. Not only has our financial security been impacted, but homeowners in foreclosure suffer devastating physical and mental health impacts as well. A recent study done by San Francisco’s county assessor, Phil Ting, revealed that more than 84% of the foreclosure filings in San Francisco between 2009 and 2011 were illegal. Wells Fargo and Bank of America have been two of the major culprits. Despite this damaging discovery, these banks continue to disregard demands for them to stop pursuing foreclosures until they can guarantee that they are not taking away homes fraudulently. California is currently ranked number 2 in the nation for foreclosures, and all in all there will be a total of 10 million foreclosures in our state this year alone. Illegal foreclosures are not the only crimes being committed by the big banks. They have also been illegally evicting tenants from foreclosed properties as well. Representatives of the banks often send notices demanding tenants move because the building has been foreclosed, when both Oakland and San Francisco laws clearly state that tenants in foreclosed buildings have the right to stay in their homes. These representatives harass and threaten tenants into accepting small amounts of money to move out, when often these “deals” do not adequately cover the expenses of finding a new home and moving costs, not to mention the stress and anxiety incurred by the families. When banks foreclose on buildings with rental units they essentially become landlords and building managers. They legally assume responsibility for collecting rent and for all necessary upkeep and repairs that the buildings need. In many cases they do not keep up their end of the deal. They neglect to pay for utilities leaving tenants with no water or garbage service in some cases. They refuse to perform necessary repairs and force tenants and their children to live with broken toilets, mold, rat infestation or leaky roofs. Often problems get so bad tenants feel forced to move by this negligence. It is clear that the foreclosure crisis has not only hurt homeowners, but renters as well. 40% of all foreclosures in California are rental properties. With 54% of Oakland’s population and almost 70% of San Francisco residents being renters, this crisis has really hit our cities hard. Our Housing Rights Are Under Attack, What Do We Do? Stand Up, Fight Back! 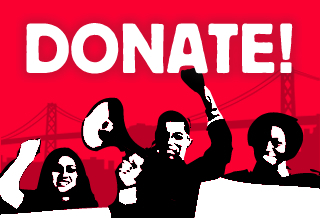 For the third year in a row Causa Justa :: Just Cause and a coalition of other community, labor, immigrant rights and other allies plan on protesting the annual shareholders meeting for Wells Fargo, which takes place in San Francisco. This action will be part of a national effort to hold banks responsible for their part in causing the housing crisis and disrupting their business in the same way they have disrupted the lives of millions of families. Groups on the other side of the country will be closing down the Bank of America shareholders meeting in Durham, North Carolina as well. We have stood up to the banks before but this year we need to roll harder and deeper than ever. Enough is enough. All of us who have been impacted by the housing crisis and the actions of these banks have to stand up and fight back. We are taking our fight to a new level. In the words of the old Freedom song, “we shall not be moved”!